Design of the Aviocar originated to provide the Spanish Air Force with a general purpose transport and first flight was made on 26 March 1971. Active military roles include ASW and Maritime Patrol, with nose-mounted radar, specified role equipment and fuselage hardpoints for torpedoes, rockets or depth charges. Specially equipped ELINT/ECM versions of the Aviocar are used by Portuguese Air Force and others. 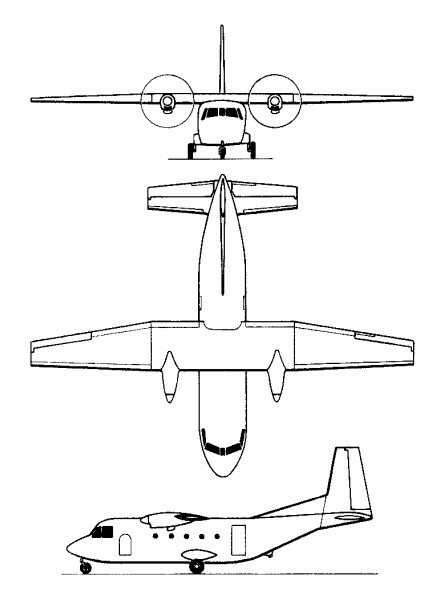 Powered by two 776-hp AiResearch TPE331-251C turboprops driving four-blade propellers, the C.212 has an unpressurized fuselage with full-section rear doors for heavy freight or for paradropping. Able to operate from unimproved 2,000-foot strips, loads, with a flight crew of two, include 2000 kg (4410 lb) of cargo, 15 paratroops and jumpmaster, or 12 stretcher patients and three attendants or sitting casualties. Versions are available for navigational instruc-tion, air survey and other special roles, and studies have been made of armament schemes which include stores pylons for guns, bombs or rockets under the fuselage and wings. The prototype flew on March 26, 1971, and by late 1976 well over 100 had been sold. Since early 1987 the standard production version was the Series 300, which has an increased maximum take-off weight of 8,000kg (for the military variant), improved range and payload, and structural modifications including a redesigned nose and glassfibre wingtips. The military version can carry two 500 litre auxiliary fuel tanks on underwing hardpoints. The 26-seat commercial Series 300 flew in September 1984. Several special-mission Aviocars are offered, including an Elint/ECM version and an ASW/maritime patrol model. The ASW/maritime patrol model is equipped with a nose-mounted 270 degree scan APS-128 search radar for maritime patrol or a 3600 radar for ASW duties. Two underwing hardpoints are provided. The Mexican Navy purchased nine Aviocars for maritime duties (plus another for VIP transport) without radar but retaining other maritime equipment. The 212 was manufactured under licence by IPTN from 1976 as the NC-212. By 1990 a total of 435 aircraft were built. Takeoff distance (50 ft) 1,588 ft. Landing distance (50 ft) 1,700 ft. Initial ROC: 455 m / min. Engines: 2 x Garrett TPE-331-501 C, 900 shp. Maximum ramp weight: 16,537 lbs. Maximum takeoff weight: 16,427 lbs. Standard empty weight: 9700 lbs. Maximum useful load: 6272 lbs. Maximum landing weight: 16,207 lbs. Maximum usable fuel: 3538 lbs. Best rate of climb: 1735 fpm. Maximum single-engine rate of climb: 345 fpm @ 112 kts. Single-engine climb gradient: 182 ft/nm. Normal cruise @ 10,000ft: 192 kts. Fuel flow @ normal cruise: 650 pph. Stalling speed clean: 84 kts. Stalling speed gear/flaps down: 71 kts. Turbulent-air penetration speed: 147 kts.